Saturday night I noticed the storefront at 170 Franklin Street has a new tenant. Over the years I have seen many a business come and go from this space so it’ll be interesting to see if this one “sticks”. 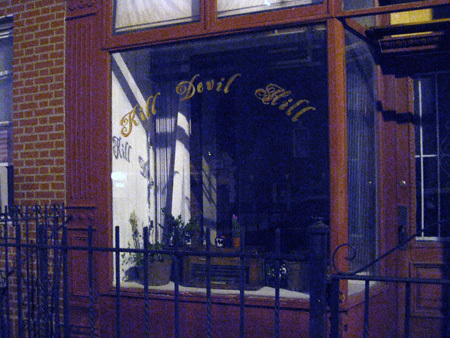 My curiosity is killing me as to what “Kill Devil Hill” will be. Anyone out there in the know? If so, do share. Kill Devil Hill is the name of the place the Wright Bros. took their first flight airplane to test and is the place of their first flight. Its in NC. My guess is the shop owners may be from NC or OH. I’ve been there, The Wright bros are from my home town of Dayton, Ohio. And before building airplanes they made and sold bicycles. I rode my bike from Dayton to FL in 2000, and went through NC and Kill Devil Hills on my way. googling “kill devil hill greenpoint” brings you to a myspace page link. sounds like it’ll be a store – or a “general store of sorts” to quote. Good catch! Here’s a link to their myspace page. Think 105 years ago, this December. Perhaps this is only expected to last 12 seconds. If you’re ever in Kill Devil Hills, NC check out Lucky 7s bar. It felt like home.